I had been married three weeks when I discovered that I didn’t really know my husband. We woke up that 3rd Saturday after we married, and I innocently suggested that we go for a walk on such a beautiful September day in Utah. The sky was intensely blue with not a cloud in sight. I was new to this area where my husband grew up, so again, I innocently let him choose the place to walk. 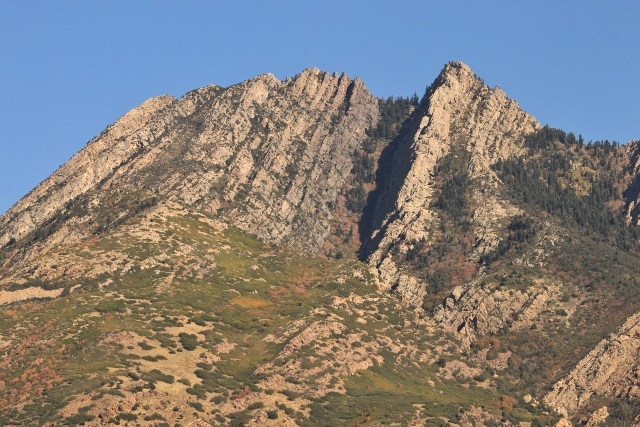 We started out on a path at the base of Mount Olympus, one of the mountains very close to Salt Lake City. I love going for walks and was enjoying the cool morning air and comfortable pace. The path started to climb and turn. The terrain became a little more challenging, but we were still having fun after about an hour’s walk. When two hours had passed, I was getting thirsty and the climb was getting more and more challenging. Since I had thought we were out for a short walk, we hadn’t brought any food or water. My husband kept urging me on, saying we could go to the top. I didn’t believe he was serious. Ha! He was. I started to get nervous and suggested we come back another day more prepared. He refused to turn back. Soon I found myself standing up and lying down at the same time on the rocky face of the north side of the mountain. The shale was slippery. We had no rope, no gear, no water, no food. That was foolish, but what did I know? I was sure I was going to be face-to-face with a rattlesnake or a mountain lion at any moment. I was terrified, but I kept on. We finally reached the top. The view of the valley made the terror almost worth it. Miles and miles of valley clear to the Great Salt Lake. New problem. How to get down. Death would be certain going down the way we came up. So my ever-optimistic(?) husband said, “My sister lives just down there. We can go down and get lunch at her house.” I blindly followed. Shielding my face from being scratched thoroughly by scrub oak, I followed as we made our way down the mountain. No trail to add to no water, no food, no gear, no rope. Our morning walk turned into an 8-hour hike. He saw nothing out of the ordinary. I felt my life had been in danger. I learned there was a lot to learn about this man I married. Love takes us on strange ventures made possible only by the trust we choose to place in each other! Impressive hike, unforgettable life journey! WOW!! As I read, the tip of the mountain appeared on my computer screen, adding to my suspense, wondering if you’d make it through this hike. The pacing and details of this story are so well crafted! !